It was as if fall made an early appearance a few days ago. The temperature was perfect as I sat on the front porch swing drinking apple crumb donut coffee. It was quiet. Then I heard the familiar murmur of hummingbird wings. There was one, then another and another. I counted six in just a few minutes. They were so close, I probably could have touched one if I was faster. I marveled at the amount of hummingbirds in such a short time. I didn’t plan to attract hummingbirds, I didn’t even think about them when I was planting my garden. I recalled the countless, red hummingbird feeders in my past and the hummingbird food (homemade and store-bought). Hung in the perfect location according to Google. Stars aligned, wind blowing out of the east and a full moon, but no hummingbirds. I have never successfully attracted hummingbirds despite my best laid plans. Hummingbirds and I just weren't connecting until He taught me to cease striving. It isn't about the hummingbirds, it is about the Lord and what He wants to do apart from my best laid plans and attempts to do anything. I am a planner, I like lists and knowing what to expect, but more and more He is drawing me away from that and into faith and hope and trust. Hummingbirds are attracted to certain colors and certain flowers, but I didn't orchestrate what attracted them, it was their nature, it was how God created them. It was His influence on my heart to plant what I did, where I did - I had no idea what I was doing. When my husband and I got married he had an enormous garden bed in the backyard, it was at least six feet by 20+ feet. It was begging for a garden. When I told him I wanted to start planting there he said, “No, I am going to put in a butterfly garden.” He had all the books, knew all the plants he needed, but had never done it. It was overwhelming, maybe even too overwhelming. So, I asked if while he was waiting to do this I could put some stuff in, he said, “Yes.” You know what happened? We had butterflies, lots of them. There are many things I’ve wanted and still want to do in my life, but sometimes I give up because it seems overwhelming or impossible. It seems like way too much for me to do and it usually is. It seems too taxing on my already busy schedule. But, I am learning if I seek the Lord and do only what He is instructing, He brings the fruit, the rain and the hummingbirds (and butterflies). Planning is not bad, neither is preparation, but doing either instead of just simply living in an intimate relationship with the Lord is futile at best. Today, He asked me to be quiet and I mean completely quiet, not even worship music, which if you know me is a stretch, a big one. But, I did it and you know what happened, God showed up just like those hummingbirds and I did nothing, but be quiet like He asked. By simply loving the Lord and spending time with Him I have reaped a greater harvest than I ever dreamed of. His economy is multiplication, growth and fruit. We know obedience is better than sacrifice, but sometimes God just honors effort. If you Google “how to attract hummingbirds” you will get exhaustive results and you will be exhausted trying to accomplish the 101 ways to attract hummingbirds. 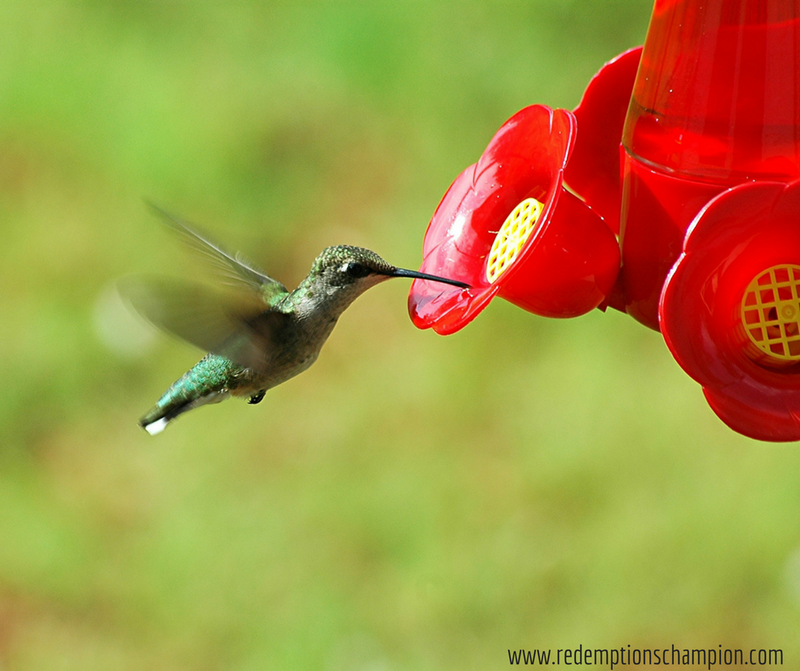 A hummingbird finds what it’s looking for by instinct - the same with us, but our “instinct” is the Spirit of God. Beautiful, Mari, and a sweet reminder for me in this season to "cease striving and know He is God." I love you!! Yes, rest friend. He has you in the palm of His hand and you are covered by His feathers. Today with you was a treasure!! !